This year has been a bit of a challenge in terms of timing for processing our Christmas turkeys. Until very recently, the closest place to have the birds processed was up in Cowichan Bay an hour or so north of here – a journey that requires a VERY early start to get the birds there on time and then a return trip the following day to pick them up again (the processed birds can’t be transported until they have been sufficiently chilled). As you can imagine, the demand for slots is huge right before the two major turkey feasting holidays, so it is not easy at all to book a date that is close enough to Christmas to be able to offer customers fresh birds. Add to this the fact our Ridley Bronze turkeys take their own sweet time growing to a decent size so an early date and frozen birds is not a great solution for us, never mind the fact our customers overwhelmingly prefer fresh birds to frozen (though, I have to say that having tasted both, there isn’t a noticeable difference in flavour). Anyway, the closest date we originally were able to get to Christmas was December 13, which meant very stale ‘fresh’ birds (too stale, really – though there is no definitive number of days a fresh bird can sit properly refrigerated, we were uncomfortable selling birds that would be 10-12 days before preparation). So, we were resigned to selling them frozen. Then, we heard through the farmer grapevine that a new processor had been approved here on the Saanich Peninsula and, when I got in touch, I was delighted to hear he had space for our birds on December 21 (ready for us to pick up and get them to our customers December 22). Not only can we provide fresh birds, they benefit from an extra week or so of growing. Now that we have the processing date finalized, I can post the link to our fancy schmantzy online order form. Please note, we do not produce a huge number of birds and they grow to the sizes they want to grow. To avoid disappointment, please, please order sooner than later so you have the best chance of getting a bird close to the size you are hoping for. We do our best to match you up with a good dining partner, but it’s not like we are running a factory farm here with thousands of birds to pick from. We always sell out, so if you are interested in a fresh, local, delicious heritage turkey, click on that there link and let us know! We are now able to take VISA and Mastercard – details for payment options are on the form. Over the next little while we’ll post some favourite recipes and cooking tips – these birds are not quite like the broad-breasted whites you’ll find in the supermarket. More on that, too, in future posts – for now, just wanted to give you the heads up on our late-breaking turkey news! 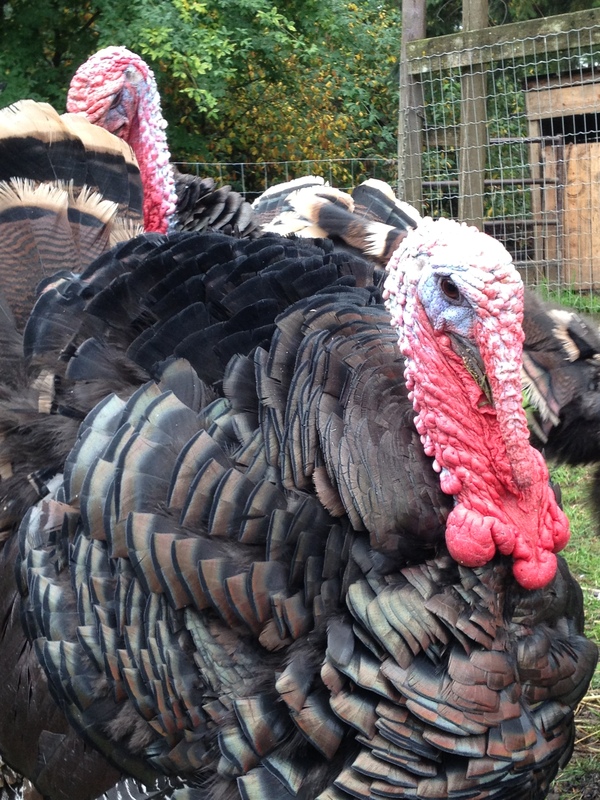 This entry was posted in Blog, Turkeys and tagged 30 Day Farm Blog challenge, christmas turkey, Dark Creek Farm, farm, Ridley Bronze turkey, turkey dinner, Vancouver island. Bookmark the permalink. Yes, we are curious indeed – I’ll do an update after we see how it goes. I sure hope it works out because as you say, that drive over the Malahat at the crack of dawn in the depths of winter is no fun at all! 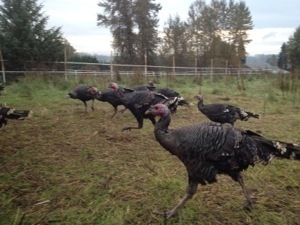 We have been wanting to raise turkeys. Do you find them to be easy to raise? About how long til they reach processing size? I’ve found them to be more finicky than chickens or ducks, particularly when they are young. They are very sensitive to temperature fluctuations and need a bit of coddling to get them off to a good start after hatching. After that, it depends a bit on how you are raising them. Ours are out and about after they are about 8 weeks old and can handle the weather (their feathers coming in usually coincides with our nice warm, dry summers) which does mean they are vulnerable to predators, injury, and doing silly things like gorging on poisonous mushrooms. I suspect if they were more closely contained and supervised and fed a more restricted diet you could decrease mortality rates, but we have gone the route of hatching out some extras to allow for some losses due to the way we raise them. In terms of how long it takes to grow them out, that depends on the size of bird you want at the end. Bronze turkeys like ours are smaller than the broad-breasted whites and tend to grow more slowly. We need a minimum of 6 months to get them to a decent size. Hens after 6-8 months will dress out between somewhere between 8 and 12 lbs, Toms somewhere between 15-18. We get some individuals that grow a bit bigger and I also sometimes get really runty little ones that just won’t grow no matter one. The broad-breasted whites will give you a dressed bird quite a bit bigger (also depending a bit how you feed them) in 24 weeks or so. In Canada, unless you start your hens laying early by using lights, it’s tough to get bronze birds to a decent size by our Thanksgiving in October. Last year I kept back my smallest, latest hatch birds and grew them out over the winter so we had some birds available for Thanksgiving, but given how long I was feeding them, I’m not sure that was so viable from a financial standpoint.